The maintenance of a free press is necessary for the preservation of a democratic society. Unless the public is made aware of the actions of its government, there is no way for citizens to hold their government accountable. If those in power are simply able to prevent the media from reporting on their bad acts, the public will never know about these abuses, and those in power will never be held accountable. In order to prevent the suppression of the press, the United States has many protections in place for whistleblowers and reporters who reveal misconduct by those who have been elected to serve the best interest of society. The United States has regularly criticized governments which attempt to silence dissent through controlling the press. These countries, usually dictatorships, will often kidnap, falsely imprison, and torture reporters who attempt to challenge the propaganda by those in power. In such countries, the reporters’ fear of being persecuted by those in power prevents most reporters from doing anything but repeat the lies of the government. While the United States still condemns such repression of the press in foreign governments, our government has unfortunately begun to persecute those in press who reveal damaging information about it. In the past several years, the United States government has waged a war against whistleblowers and reporters who have released damaging information about the government. The whistleblower Private Bradley Manning and the journalist Julian Assange have borne the brunt of this persecution and are still being attacked to this day. Bradley Manning was a US Army Private who released a tremendous number of documents to the press and to the site “Wikileaks”. While many of these documents were benign, some of them included evidence of terrible misconduct by the United States government. The more egregious things exposed by these leaked documents included videos of attack choppers killing unarmed civilians in Iraq (the “collateral murder” videos”) and communications discussing the torture program of United States detainees. These files had been covered up by the government, because of their damaging nature, and nobody knew about the true extent of this misconduct. Upon releasing these documents, Private Manning was detained and is currently being charged in front of a military tribunal. At the time of his arrest in 2010, Private Manning was detained in the brig at Quantico. For most of his pre-trial imprisonment, Manning was held in solitary confinement, stripped of his clothing, and denied any contact with the outside world; these conditions are classified by our government, as well as civil rights groups, to be forms of “non-touch torture” that are banned by international agreements. While nobody deserves to be treated in this manner, the actions of the government are particularly egregious considering the fact that Manning should easily be considered a whistleblower—his exposure of government crimes classify him as a whistleblower—and the fact that Manning was held in these conditions for months before even being tried. Currently, Private Manning is charged with numerous serious charges, including “aiding the enemy”; if convicted, he will be sentenced to life imprisonment without the possibility of parole. Julian Assange is an Australian born journalist who was one of the founders of the site “Wikileaks”. 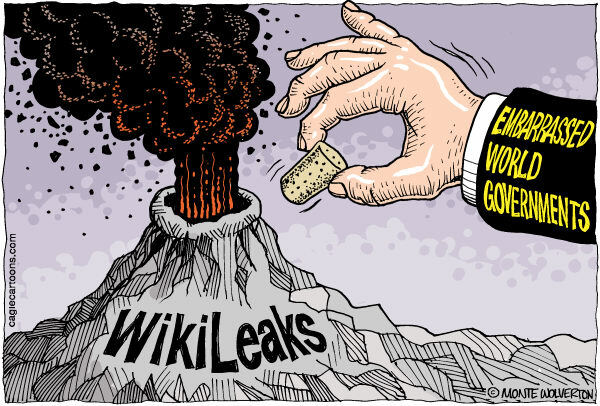 Assange created Wikileaks in order to facilitate the exposure of government misconduct and to act as a forum for people to post documents which are leaked from governments across the world. While many argue that Assange is not a journalist because he uses leaks rather than official sources, these people are wrong. The leaks posted by Wikileaks show things that official sources were not saying, and have been extremely revealing as to the true workings of governments. Assange never broke the law because he simply posted information which was given to him by his sources. Due to the nature of his site, Assange has been the target of numerous attack campaigns. The attack campaigns on Assange and Wikileaks have been aggressive and have caused significant disruption to the sit and its founder. The government utilized its contacts with several major banks and online payment companies to put up a financial blockade of Wikileaks; due to this blockade, many people were simply no longer allowed to donate their own money to the site. This tactic has starved Wikileaks and has caused them to operate primarily on reserve funds (gathered before the blockade). 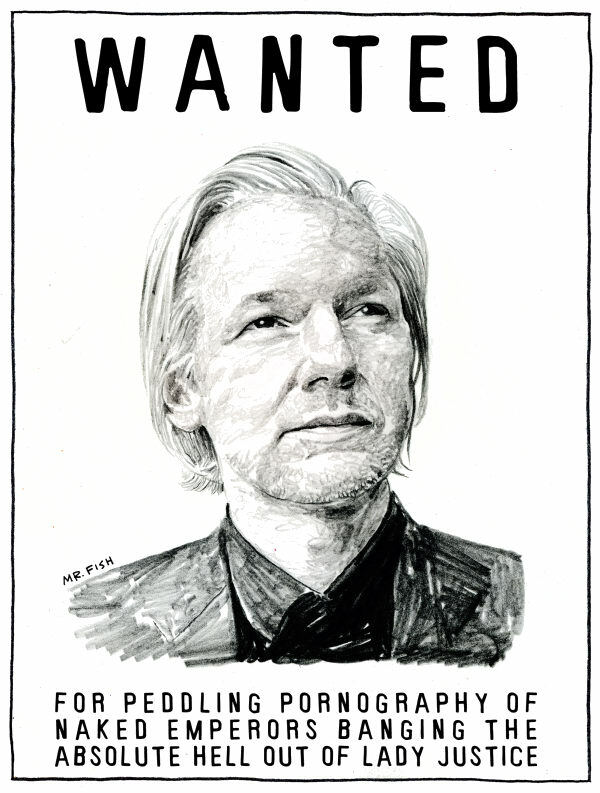 Several individuals connected to Wikileaks have been harassed, searched, and had property taken simply due to their connection with Assange. Jacob Appelbaum, a spokesperson for Wikileaks, had his cell phone and laptop seized while going through customs; these devices were never returned to Mr. Appelbaum, and no search warrant was ever produced to justify the government’s action. An association with a journalistic organization which exposes government lies does not justify the government to violate an individual’s constitutional rights. The most recent, and most dangerous, example of United States government harassment of Wikileaks and Assange is the case against Julian Assange. Assange has been accused of sexual misconduct by a woman in Sweden and the Swedish authorities have asked for Assange to be extradited (he is currently living in England) for questioning. While the case of sexual misconduct has yet to be adjudicated, many people believe that it is simply being used as a pretext to send Assange to the USA for detainment and torture. Assange agreed to talk to Swedish authorities in England or to go back to Sweden to face charges, but only if the government of Sweden guaranteed that they would not extradite him to the USA. As Sweden refused to agree to this, and has a history of extraditing people to the USA, it is a logical conclusion that they planned to extradite Assange to the USA. If extradited to the USA, Assange would likely find himself subject to long-term detainment and solitary confinement, if not worse treatment. Fortunately, Assange has been granted asylum by Ecuador, and it appears unlikely that he will be sent to the United States any time soon. The persecution of whistleblowers and journalists who report on government crimes tells us one very simple, but very troubling thing: the United States may claim to support a free press but, in practice, has become willing to turn a blind eye as our government attacks those who practice true journalism. Revealing the misconduct of our government is not an act of treachery, nor is it an attack on the United States—it is a public service and a vital component of our democracy. If the government can simply classify all of its illegal acts and criminalize those who reveal these acts, then there can be no accountability. Those who reveal the wrongdoings of our government, even at great personal risk, should be hailed as heroes and protected from consequences; without these people, our government would continue to commit crimes in our names, and we would never know about it. Many will claim that leaks are dangerous and should be prosecuted, but these people are only half right. A whistleblower is a person who releases information on the wrongdoings or illegal conduct of the government (or a corporation) and releases it in order promote accountability; in order for somebody to be a whistleblower, the information released must reveal wrongdoing, and the leaker may not sell this information for personal profit. If a person leaks top secret information that poses a danger to the public and has no accountability or transparency value (ex. leaking nuclear missile codes), they are not a whistleblower. Similarly, if a leaker sells their information to a corporation or a foreign country, they are a spy, not a whistleblower. Bradley Manning and Julian Assange released information revealing wrongdoings which were covered-up by the United States government. Rather than sell this information (which would have been extremely profitable), Assange, Manning and the rest of the people working with Wikileaks, put the information out for the public to access. These people are the textbook definitions of whistleblowers (under the Whistleblower Protection Act) and any attack on them is a violation of the law. With the United States’ extra-legal attacks upon journalists and whistleblowers, what high ground can we stand upon while criticizing Iran or China when they repress their media? The United States government has detained without trial, tortured, and taken the property of those who have revealed its wrongdoings. In addition to what we have already done, some politicians have claimed that Assange should be classified as an “enemy combatant” and should simply rendition or assassinate him without any legal proceedings. What could other countries, even repressive regimes, do to top what the United States has done (or plans to do) to our own journalists. To conclude, let me leave you with these two questions? What does it say about us, as a country, when the perpetrators of torture and the killers of civilians have yet to see the inside of a jail cell, while those who revealed these crimes are facing life in prison (and probably solitary confinement)? If the government is committing crimes in our names, would you rather live in ignorance or try to change things? When revealing information about government crimes is tantamount to suicide, few people will be brave enough to speak up and let you know about the misdeeds of your government. This is a great essay raising undeniable questions about the growing culture of censorship in N.A. Could you, in the future, present the other side of the coin and explain the rationale the American govt. uses? Thank you for taking the time to read my article and to respond. As to your request that I present the other side of the argument: I understand the need to have balance in any argument, but this is a case where the establishment media has focused on the government side to the exclusion of Mr. Assange and Mr. Manning. Consider this article a counterpoint to the establishment story, and an attempt to give balance to an unbalanced narrative. To date, the government has made several arguments around this situation. First, they claim that the leak of documents damaged national security and led to US troops being endangered–this is simply untrue, as the US government has been unable to present a single piece of evidence to support this claim. I would also note that a reporter is not liable for the reactions to what they support (ex. we have concrete evidence that deaths resulted from the reporting of Koran burnings, but the reporters aren’t liable). Second, they claim that Manning is a traitor and that his release of documents was criminal–this is more valid than the accusations against Assange, but it is not legally sustainable. Manning is clearly covered under the whistle-blower statute, and the only consequence that he should be facing under the law is a dishonorable discharge and a revocation of his security clearance. I recently heard that federal whistleblower protections are under attack and about to be severely reduced. Do you know anything about that? As far as I can tell, it isn’t that whistleblowers are receiving less protection but that the definition of “whistleblower” is shrinking to virtual non-existence. I’ve been exploring for a bit for any high quality articles or weblog posts on this sort of area . Exploring in Yahoo I at last stumbled upon this web site. Reading this info So i am happy to exhibit that I have a very just right uncanny feeling I discovered exactly what I needed. I most indubitably will make certain to don?t fail to remember this site and give it a glance regularly.